Everything you need to know about negotiation can be learned from the country song, “The Gambler.” Starting with: “If you’re gonna play the game … you gotta learn to play it right.” Learning to negotiate well will never fail to be useful. If you own a house, receive a salary, have been to a yard sale, or have children, negotiation is a big part of your day-to-day. Even if you have studied negotiation at length, it never hurts to consider tactics from a new source. And there’s a good chance if you’re a lawyer, you negotiate for your clients. Fortunately, like most professional skills, negotiation is not impossible to learn. I recently spent some time educating myself on the matter. What I learned is that negotiation is an art, not a science. It is definitely a worthwhile subject of study and is something you can continue to study and perfect for your entire profession. Throughout my research, I came across many of the same tactics over and over again. Here are a few principles the most successful negotiators seem to agree on. Always be professional and always be ethical. Beyond those immutable axioms, there is no technique that is right for every situation and every person. Knowing techniques is good, knowing when to utilize each technique is crucial. 2. Every hand’s a winner and every hand’s a loser. Most negotiations do not end with one party winning and one party losing. What makes this deal a “winner” to your client? Do not assume you know the answer to that question. It is important to engage with your client in a discussion about what a successful outcome means for them. Once you really understand the answer to that question, you may learn that you and the other side can both win at the same time. 3. You can tell a person’s cards by the way they hold their eyes. Once you know what ‘winning’ means to your client, you need to find out what it means to your opponent. Where possible, know as much as you can about your opposing counsel (also known as your colleague) and the business interests involved. For instance, let’s say an opposing lawyer is threatening to sue your client in New York state court next week. It would be very illuminating to discover that lawyer is an estates attorney located and barred in Texas. Also, ask yourself what your colleague’s responses tell you about their angle. For instance, if they have been instructed to negotiate, but to not kill the deal under any circumstances, that may become apparent relatively quickly. It’s good to know the facts as well as possible; however, your colleague does not need to know how well-versed on the subject you are at first. It can be very helpful to begin negotiations by having the other side explain the situation to you as though you know nothing. Try to actually listen. You did the research, so hopefully you already know the facts, but by getting a description from your colleague up front you accomplish several things: (1) you achieve an immediate understanding of what your colleague considers important; (2) your colleague unburdens herself giving you her ‘side’ and, hopefully, feeling as though you understand it; and (3) you get to make sure you and your colleague are working with the same set of facts. By obtaining your colleague’s side of the events early on, you can listen empathetically and respond non-committedly in a way that is much harder down the road when it becomes clear you are fully aware of the facts. 4. Know when to hold ‘em. Psychologists agree that there is an anchoring bias associated with the first number a person hears. If you find yourself intimidated to throw out the first number or offer because you aren’t sure if you are off base, your colleague may be in the exact same spot. By throwing out your number first, your colleague will face immense psychological pressure to ‘fold’ and will adjust their number closer to yours. The times when you are the most unsure of what offer to start with are often the times you stand to gain the most from offering the first one. 5. Know when to walk away, and know when to run. Be cordial. Be professional. With that being said, some of your colleagues may not take that advice, and will not be nice to work with. 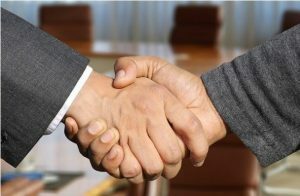 If you have a colleague who is getting under your skin, do not be afraid to bring another attorney in to work directly with them on the negotiation. Everyone has personalities with which they clash. If you’re going up against a colleague and find your negotiation efforts are forestalled due to personality incompatibilities, you owe it to your client to tap out and call in a different attorney. In addition to being “nice,” be a “person.” In other words, don’t be afraid to let some of your humanity shine through. Try it out. Sharing even a few personal details such as your weekend plans has the dramatic effect of humanizing you. Viewing you as a human will make it harder for your colleague across the table to be completely unreasonable. Next time negotiations are getting tense, consider taking a break and ask a question or offer a personal detail or anecdote. It’s surprising how connecting as human beings for just a few minutes can bring negotiations back on track. Sara Sharp is an attorney at Sparkman + Foote LLP. She can be reached at sharp@sparkmanfoote.com. This post originally appeared in the Docket.